Joy, Michael and Maria Rose. "Maria! Michael and I are pleased to announce the arrival of our beautiful girl, Maria.". 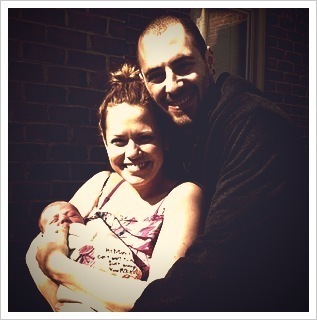 Wallpaper and background images in the ওয়ান ট্রি হীল club tagged: bethany joy galeotti michael galeotti baby. This ওয়ান ট্রি হীল photo contains প্রতিকৃতি, ধনু, and চতুর. That baby is so beautiful! Congrats to both of them! Maria Galeotti sound so pretty! cute, didn't know she had it already, must have missed the tweetich. AWWW! Congrats, Joy! Beautiful baby gril!!! Lovely photo!I'm so happy for Joy!